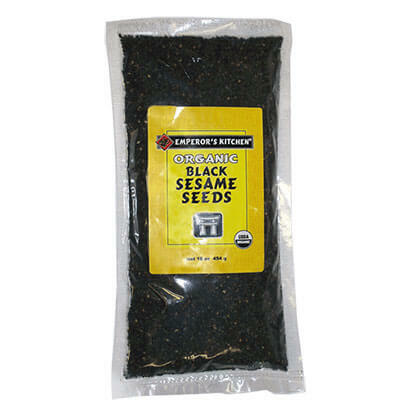 Emperor’s Kitchen Organic Black Sesame Seeds are tasty and USDA certified organic. Black sesame seeds have been a popular ingredient in Japanese cooking and considered to be slightly more flavorful and aromatic than the brown (or white) variety. Enjoy these delicious nutritious gems lightly toasted as a healthy topping to rice or whole grain dishes, noodles, vegetable stir-fry, fresh garden salads or in your favorite baked breads and desserts. Long a popular ingredient in Japanese cooking, black sesame seeds are considered to be slightly more flavorful and aromatic than the brown (or white) variety. They are often roasted and used whole as a colorful garnish on rice or other grains, noodles, or vegetables for added flavor and concentrated nutrition. INGREDIENTS: Organic black sesame seeds.